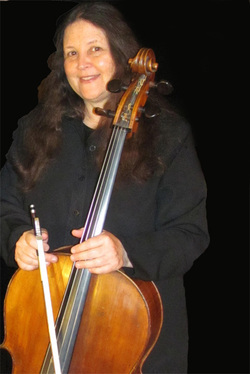 Michèle Brosseau-Tacchia, a noted concert cellist on the East as well as the West Coast has a passion for sharing her vast knowledge of stringed instruments with children. She has been teaching music in the Inland Empire for over 30 years. Having received her BA degree in Music from California State University, San Bernardino in 1976 and a Masters Degree in Music Performance from San Diego State University in 1982, she also pursued postgraduate studies at the prestigious New England Conservatory of Music in Boston, Massachusetts (1976-77), the Vienna International Music Center in Vienna, Austria (1977-78) and at the San Francisco State University Department of Music (1978-79). She has worked with some of the world’s finest musicians. It is this depth of vision that she seeks to share with her students and to open their eyes to the wonderful world of music. With her husband Michael Tacchia, (pianist/teacher), she has performed throughout the United States, Mexico and Europe and they have established a reputation as the Brosseau-Tacchia Duo. She was a member of the San Bernardino Symphony Orchestra and the Redlands Bowl Summer Festival Orchestra for 25 years. She became one of the youngest members to play for the San Bernardino Civic Light Opera Orchestra at age 19 and went on to play with the organization for 20 years. She feels strongly that she can be of the best role model and inspiration to her students as well as giving them the best opportunities by maintaining her role as a performer. Mrs. Tacchia established the Elementary Magnet Schools Honor Orchestra providing performance opportunities for young children. Since 2007, she has produced the San Bernardino County Elementary Honor Orchestras involving hundreds of young string players. In 2008, Michele Tacchia founded Symphonie Jeunesse Orchestra, which is comprised of serious advanced string players ranging from 12 to 22 years of age. ‘Symphony Jeunesse’ has toured Southern and Central California. Mrs. Tacchia served as principal cellist of the CSUSB Chamber Orchestra in its formative years from 1972-1976 under the baton of its founder/director, the late Dr. Richard Saylor.